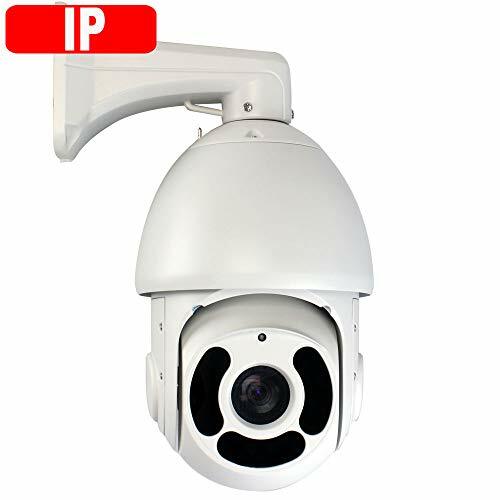 The PTZ or Pan-Tilt-Zoom camera is a security camera that captures high-quality video clips for surveillance purposes from different angles. It offers an efficient and economical solution to display multiple areas and extended properties with a single camera. With this camera, you can change the focus of the lens and view different fields of vision without lowering the camera or rotating it in any other direction. Whether for indoor or outdoor use, these cameras are the easiest way to monitor a business or home thoroughly. PTZ cameras can be classified on the basis of data transmission ways, image definition, zoom lens and PTZ control. With so many options and variants available, selecting the best PTZ outdoor camera can be a little tricky as there is no comprehensive guide available that could help you find the best Pan Tilt Zoom camera. 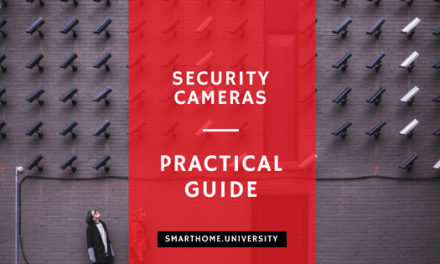 But, this guide will help you in understanding what a PTZ security camera is, how it is set up, and how to control a PTZ camera. 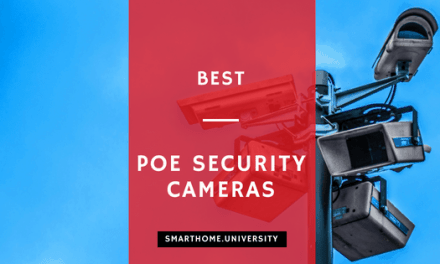 Furthermore, this guide contains an in-depth review of the best PTZ Outdoor Camera in 2019. Whether you’re looking for a more practical one or an affordable one or a mini PTZ camera, we’ll help you find a camera that caters to your needs. With intense research and testing, we’ve decided to pick Amcrest IP4M-1053EW as our best and most practical pick. With 4MP ultra high definition resolution, this camera tops our list for its amazing and practical features. The camera is known for its excellent night vision and zoom quality. GW Security 1920P is also a good option with a lot of features and amazing video quality, but it is very expensive. You can go for this weatherproof dome PTZ camera if you want increased storage space and extended recording time. 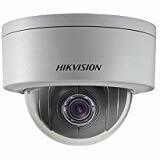 Hikvision DS-2DE3304W-DE Mini PTZ Dome is mini PTZ dome camera that captures video at a maximum resolution of 2048 x 1536. If you want an affordable and mini PTZ camera, you can definitely go with this camera. 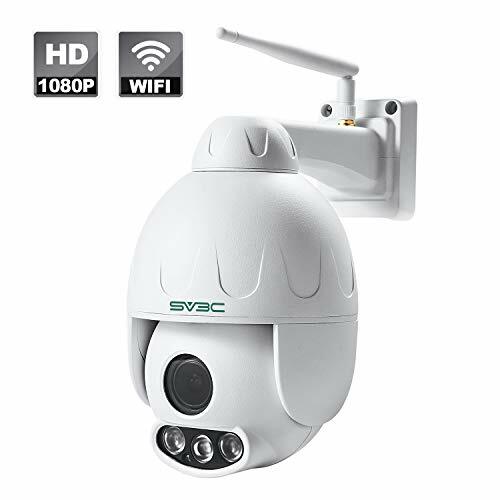 Our last pick is SV3C 1080P Outdoor PTZ WiFi Security Camera that has a feature of motion detection with push notifications. Moreover, this camera is also quite reasonable if you want a decent for your house or office. What is a PTZ security camera? How to set up a PTZ camera? How to control a PTZ camera? How to use PTZ camera? PTZ camera has pan, tilt and zoom functionality. These functions can be automatically set up using camera management software, or manually controlled by using a joystick or monitoring software. Now, what is pan, tilt and zoom? Pan – it is the ability of the camera to move from left to right along the horizontal plane. Tilt – it is the ability of the camera to move up and down vertically. Zoom – is the ability of the camera to make objects larger or bring them closer. These cameras are encased in a hard shell dome that protects it and obscures its direction from onlookers. This device is capable of zoom control and remote direction. Mainly used in surveillance, PTZ is also used in live production, video conferencing, distance learning and more. PTZ cameras are best for live surveillance applications that require wide surveillance and highly zoomed-in views for identification purposes, such as in department stores, airports, railway stations, logistics centers and museums. Some of the benefits of PTZ cameras are large area monitoring, auto-focus, night vision, weatherproof and auto tracking/ motion tracking. Mount the camera to your preferred place with the screws and the mounting template. Drill a hole to run the PoE cable from your camera to the router. Then, install and launch the security camera software to configure the camera such as position presets, motion detection, patrol etc. You can set up, view or operate the camera with multiple ways depending on your needs. You can set up the camera on your mobile device, or you use cloud storage for remote viewing of the recordings, or you can access the files on the web. You can use the app of some manufacturer’s to access the camera on your device. To use a PTZ camera, you just have to mount the camera on your preferred place. Then, connect the camera with the router and the PC. After completing the installation, you can set up your camera on any device and view the camera from anywhere, anytime. With functionalities like PTZ, CMOS image sensor and night vision, Amcrest IP4M-1053EW topped our list of best PTZ outdoor cameras. The camera is equipped with 16x digital zoom lens and 12x optical motorized zoom lens that lets you experience close details along with continuous 360° pan, 90° tilt capturing every angle. Moreover, it has the latest 1/3”4 Megapixel CMOS image sensor along with Ambarella Chipset S3L55M, which delivers striking UltraHD 4-megapixel at 30FPS videos. The camera has an IP66 rating that protects it from most weather effects. Be it rain or the sunlight; it can undergo extreme weather conditions. The camera features IR LEDs along with innovative starlight technology from the CMOS image sensor and is designed to provide coverage up to 328 feet in the dark and ultra-low light. The H.265 compression technology allows for files to be compressed without any noticeable difference in the quality and saves up to 50% storage space. The advanced zone detection feature of the camera allows you to create motion detection zones and customize a complete control over what you’re monitoring. With intelligent alerts, you can get alert notifications to your smart device or computer using the Amcrest view app. The footages can be stored on your computer, NAS, MicroSD or Amcrest cloud. Also, the intuitive interface lets you live-stream the video that enables you to play it back according to your needs. 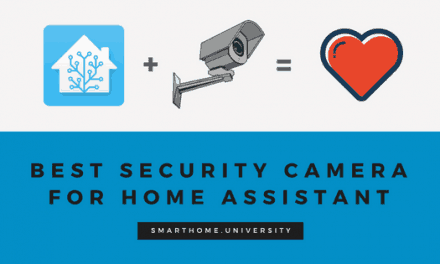 Furthermore, the camera features SSL and HTTPS encryption that ensures data privacy. Besides, the camera comes with 1-year warranty. However, the camera is a PoE+ camera that needs a separate PoE switch or PoE injector to operate. The 5.5mm fixed lens with a maximum aperture of F1.6 generates outstanding visuals owing to the remote 360° viewing angle. No, this camera doesn’t have audio. But, it is designed to accept an external mic with audio. Does it require an NVR? No, you don’t need an NVR to run or collect the recordings from this camera. Also, this camera accepts a MicroSD card for onboard storage. Does this have a starlight/ starvis sensor? Yes, this camera supports Starvis sensoring. The STARVIS is back-illuminated pixel technology that is used in CMOS image sensors for monitoring camera applications. To log in for the first time, you’ll need the following default username and password. After you log in, make sure you change your password to a more secure one. Then, you can set up your camera on your preferred device. 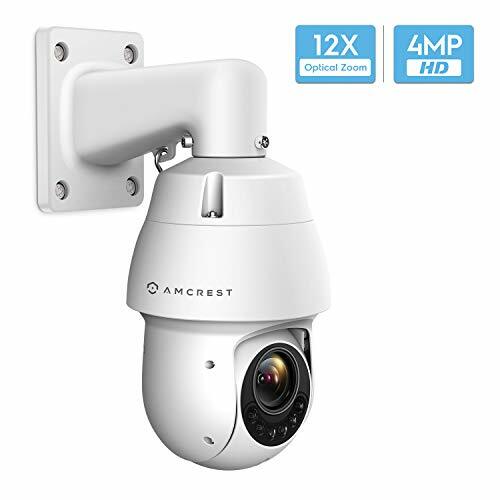 Another great alternative is Amcrest IP2M-853EW that features 12x optical zoom and 16x digital zoom for capturing even the smallest detail. With the 2MP resolution, this camera is compatible with PoE+ power (802.3at) standard. 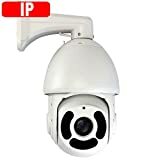 This is another great and reliable option in PTZ security cameras that delivers stunning and high-quality super HD 1920P video resolution, but this camera is slightly expensive. However, it is a good pick and value for money if you want to cover a large area as the high-resolution of the camera works efficiently. Also, with the latest H.265 video compression, it shrinks the data-heavy files that result in increased storage space, smoother videos and extended recording time. With the latest H.265 video compression, you can view smoother videos and enjoy increased storage space with extended recording time. This latest video compression standard address problems like shortage of bandwidth. It also improves transmission efficiency and delivers ultra HD image quality. 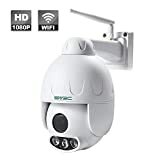 The camera features super HD high-resolution Day/ Night with 20X Optical Zoom, full 360° horizontal continuous rotation and 90°tilt with no dead angle. The camera provides super HD 1920P high resolution at 15 FPS for a great video quality experience. Integrated 8Pcs IR Led with multiple angles provide up to 328 feet IR night vision. Also, in this device, the data is automatically backed up when power fails to occur. Also, this camera is weather proof for both outdoor and indoor. With features like auto-focus, auto-iris, and auto white balance, this camera is a perfect pick for day and night recording. The only negative feedback about the product is about its price. The product is slightly overpriced. Zooms, pans and focuses very quickly. Size is a bit large. With features like line crossing detection, intrusion detection and motion detection, this mini camera shows the easiest installation, adjustment and maintenance. The camera support 4X Optical Zoom technology and PoE and 12V DC power supply. The camera offers precise detailing in the outdoor environment with its pan/tilt and 4X Zoom day/night lens. These are some of the features why this camera is on our list of best PTZ cameras. Moreover, the camera is vandal resistant, which makes it a perfect pick for outdoor use. The device is compatible with the 802.3af standard. Also, the device zooms, pans and focuses very quickly that makes it a popular choice among users. But, there are no official firmware upgrades, and the resolution is low as compared to the Amcrest 4MP Outdoor PTZ POE + IP Camera. This PTZ camera has been built and designed with outdoor surveillance in mind as it is enclosed in an IP66 and IK10-rated housing. So, if you’re looking for a functional mini PTZ camera for outdoor use, you should definitely consider this camera. The SV3C camera features a CMOS 2MP Sony image sensor that can dynamically paint all the vivid colors and rich imagery onto the smartphone or computer screen in full HD 1920 x 1080pixels. The camera is designed with a built-in speaker and microphone with which you can talk or listen to your family, pets and greet guests in real-time. Also, the camera features 2.7~13.5mm Motorized Lens. You can manage the 355° horizontal and 120° vertical pan and tilt via phone/tablet/PC that offers you no blind area vision. The camera is equipped with high-intensity IR LEDs, which illuminates details in clear, crisp vision up to 165 feet away. In addition, the camera also detects motion and can send alerts to your mobile device. You can customize the motion detection area and sensitivity on your phone and focus on the area you want to monitor. It will allow you to reduce false alerts. Moreover, the camera is weatherproof and is ONVIF compatible. It is strong-built with an aluminum case that is IP66 waterproof. Besides, it is compatible with Ispy, Blue Iris, Security Spy, Zoneminder and various 3rd party software. So, if you want an affordable PTZ camera that can be used for both outdoor and indoor monitoring, this camera would make a perfect pick. Alex Brice is an experienced smart home enthusiast who has been using, reviewing and testing home automation products for over 10 years. His articles were referenced by major smart home media like TechCrunch, Cnet, Home Assistant Blog. Alex is also an active contributor to smart home communities on Reddit, Quora, Automated Home and both OpenHAB and Home Assistant Forums.His approach to testing and product review is to combine deep technical knowledge with consumer angle and practicality of home automation feature. Alex is a strong believer in smart home devices’ focus on automation, not manual control. He is also a proponent of local implementation of the smart home devices independent of the internet connectionYou can engage with Alex by visiting his twitter account where he has a strong opinion and point of view on the smart home news.